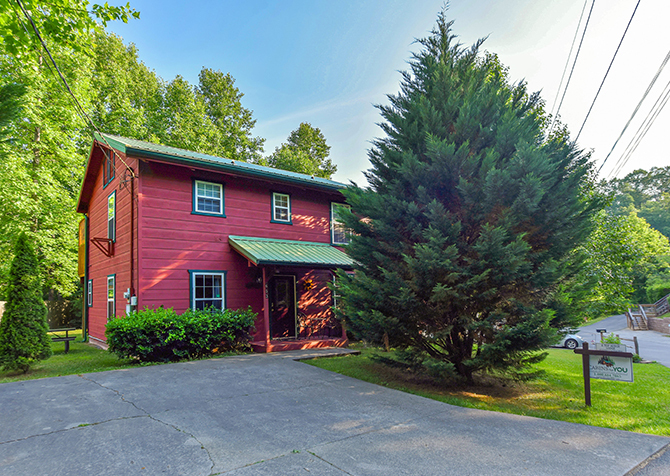 But that’s not all you’ll find inside this 5-bedroom, 5 ½-bath cabin for 16! Enjoy 5 cozy bedrooms with king-size beds, a twin bunk, a queen bunk bed, and a queen sleeper, providing your large group with plenty of options for spreading out and getting comfortable. 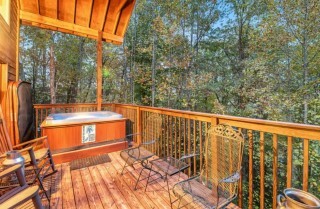 On the porch, relax on a rocking chair or in your outdoor hot tub in front of mountain and wooded views. Whether you’re bringing the entire extended family or a group of fun-loving friends, Hillsong Heaven provides your crew with a private piece of paradise in the Smokies. Best yet, you’ll be less than 10 miles from even more excitement in downtown Pigeon Forge! Don’t miss Hillsong Heaven for your next large-group getaway to the Smokies! Open, airy, and full of natural light, the large living room inside Hillsong Heaven will become a favorite place to unwind after whitewater rafting with your group or hiking to a waterfall in the national park. With a big screen smart TV, you can watch your favorite shows in perfect picture quality while relaxing on the full-size leather couch or its companion loveseat. Set your cup of hot cocoa or bowl of popcorn on the large coffee table in the center of this room—the coffee table doubles as a great space for board games or cards as well. 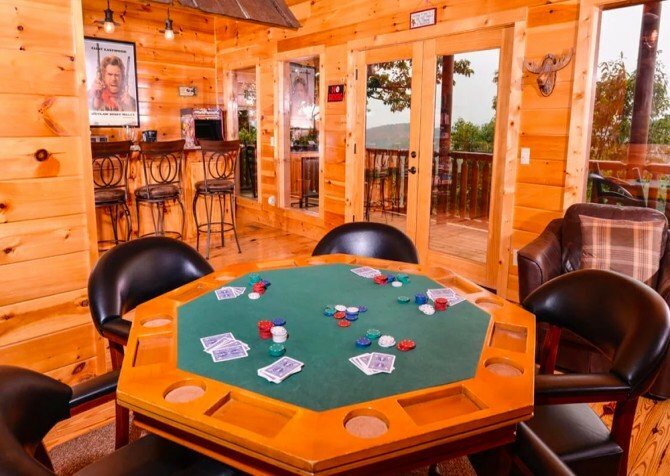 Check out the selection of board games provided by this cabin for a fun night with the family that doesn’t cost a dime! The roomy, L-shaped kitchen inside Hillsong Heaven is exactly what you’ll need for your large-group getaway to Pigeon Forge. The oak-colored cabinets with cedar insets – which match the all-wood interior of the cabin – along with the recessed lighting, updated appliances, and large windows combine to create an appealing, modern kitchen where you’ll love prepping and cooking your favorite homemade meals. Feel free to use the convenient array of equipment provided for you by Hillsong Heaven, including an electric griddle, electric tea kettle, Keurig-style coffeemaker, French press coffeemaker, and blender. You’ll also find all the cookware, utensils, glasses, and mugs you need for a cozy getaway in the mountains. Enjoy cooking in this space with its spectacular mountain views right from the kitchen sink! When it comes to feeding a large group, things can add up quickly. First, there’s the gas, time, and hassle it takes to navigate through downtown traffic, pick a restaurant, and find a parking spot. Then there’s the cost of feeding 16 guests off a downtown menu. Though we want you to try the delicious flavors and cuisine Pigeon Forge has to offer, don’t forget that eating in the cabin can save you a great deal of money and time during your getaway. In fact, Hillsong Heaven makes it easy for you to eat in the cabin with its large dining room table. Surrounded by large windows with wooded views, the dining table features log-style benches and room for 10. Overflow guests are welcome to sit at the breakfast bar in the kitchen or on the couch in the living room. This cabin’s open-concept design makes any seating combination work beautifully! Now we get to the fun part of this large-group cabin: the loft! Doubling as a game room and theater room, the loft inside Hillsong Heaven has so much more than your average Pigeon Forge cabin. With full-size games tables—including a pool table and ping pong table—and additional amenities like an air hockey table, arcade game, and electronic dart board, you’ll have plenty of ways to entertain your group on a rainy day. This is a great space for the kids to hang out during your stay at Hillsong Heaven. It’s also great for guys looking for a private space to watch the game and have some fun. The 65-inch 4K smart TV is the focal point of the theater portion of the loft. Mounted above a wood-burning fireplace and surrounded by a soft, microfiber sectional, this TV offers more than just a space to watch your favorite weeknight sitcoms. You can also put on a favorite DVD or Blu-ray, or choose a new one from Hillsong Heaven’s movie collection. Turn on the surround sound, and you’ll feel like you’re in a cozy theater right inside your cabin! When you bring 16 people to the Smoky Mountains, you need plenty of sleeping space, and Hillsong Heaven doesn’t disappoint. This cabin features 5 bedrooms, 4 of which come with a king-size bed, wood-burning fireplace, indoor jetted tub, and flatscreen TV. That’s right—you don’t have to fight over who gets the best bedroom of the cabin because they’re all the best! 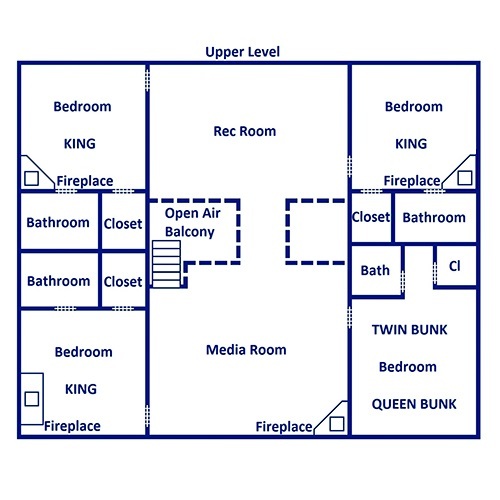 Even the fifth bedroom, which features 1 twin bunk and 1 queen bunk, comes with its own flatscreen TV. Pick the bedroom that suits your personal style—whether you want the 4-poster frame with luxurious bedding or the cozy corner bedroom with a wall of wood-facing windows. No matter where you end up, you’ll love the special care and attention given to decorating your dreamy bedroom inside Hillsong Heaven! They all feature different themes, giving each guest a fun and unique experience during the stay. 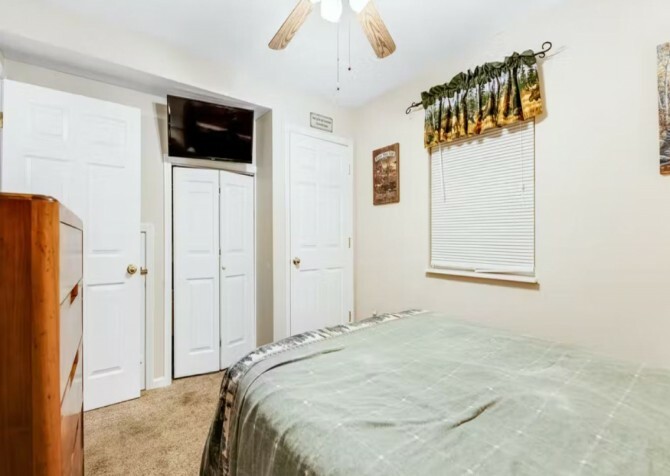 Putting you in the Christmas spirit year-round, this festive room is trimmed with a Christmas tree, wreaths, and holiday bedding. It also features a memory foam mattress for restful nights among the holiday décor. Christmas Cheer is great for those who’d like to avoid the stairs, located on the main level and easily accessible. Romantic and whimsical, this lovely room with a canopy bed will make you feel like you’re sleeping among the trees. Beautiful views outside will be the peaceful backdrop you need for a wonderful retreat. 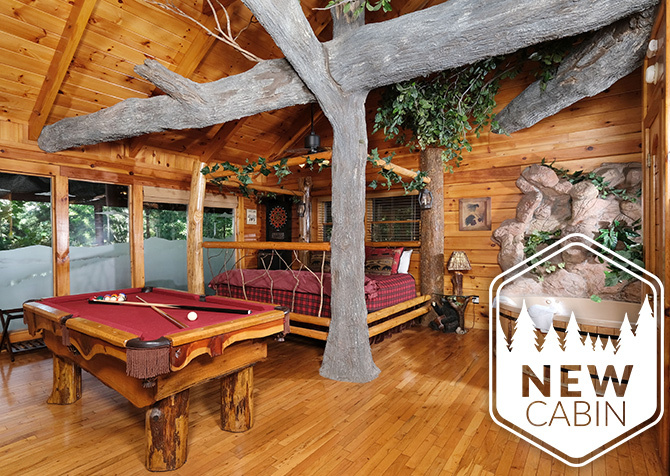 Themed after the symbol of the Smokies, the black bear, Papa Bear Den is classic Smoky Mountain style. Here you’ll find another memory foam mattress for peaceful nights and great afternoon naps. A gorgeous and rustic canopy bed is the perfect fit for this deer-themed room. It’s a warm and cozy place to enjoy a bit of the mountains – views included! The kids will love their own space in the bunk room, with cute bears all throughout. And of course, they’ll love having their own TV for Saturday cartoons and movies before they drift off to sleep. 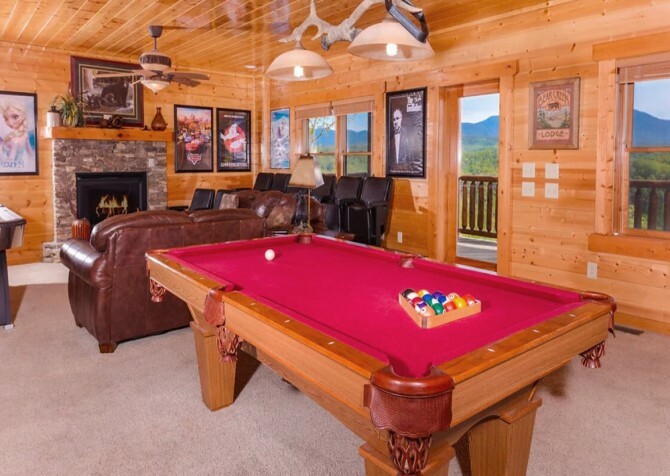 Hillsong Heaven is a secluded Smoky Mountain cabin with mountain and wooded views from nearly every angle. When you book your stay, get ready to enjoy these views from the comfort of your rocking chair porch. Besides double rocking chairs with a matching side table in-between, Hillsong Heaven offers a swinging wooden bench on the front porch, a large wooden patio table on the back deck, and an outdoor hot tub surrounded by impressive views. 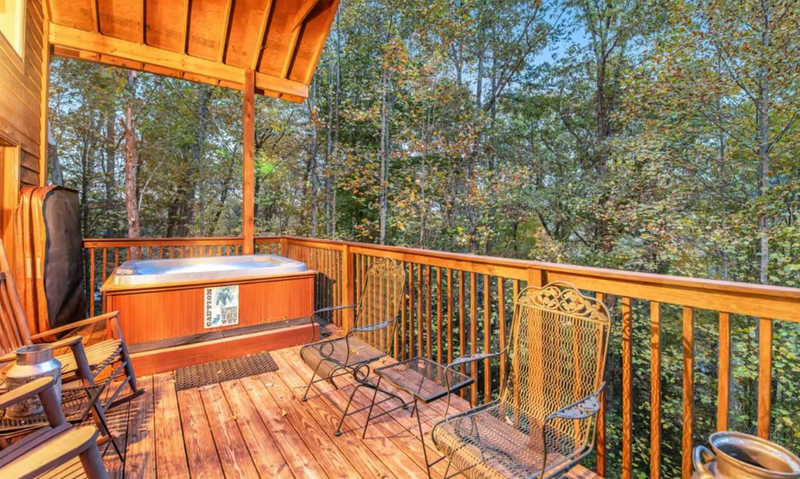 You can plan a family barbecue using the charcoal grill, a relaxing soak after racing around The Track in Pigeon Forge, or a quiet mountain morning in your rocking chair with a mug of steaming coffee in your hand. No matter how you spend your time here, you’ll enjoy the peace and serenity of the scenic Smoky Mountains. If you thought you’d heard about everything Hillsong Heaven has to offer by now, think again! This exciting large-group cabin has even more in store for your Pigeon Forge getaway. 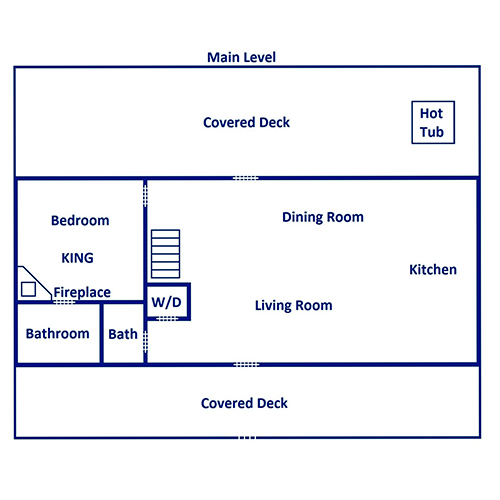 Enjoy wireless internet access, a washer/dryer, and pool access during the summer months! This cabin also makes it convenient for families traveling with small children. You won’t have to pack a port-a-crib, high chair, or baby gate when you stay at Hillsong Heaven. And to make it even more convenient, this cabin boasts a flat, paved driveway (hard to come by in the mountains!) and easy access for motorcycles. If you want a place that’s as functional as it is fun, you have to check out Hillsong Heaven! On top of all you’ll find in the cabin, Hillsong Heaven’s location in Brother’s Cove Resort offers easy access to a beautiful wedding venue with amazing views. Get married in the great outdoors, with amazing Smoky Mountain vistas as the backdrop for incredible memories (and photos). Located at The Island in Pigeon Forge, the Great Smoky Mountain Wheel is one of the largest attractions in the Smokies. Towering 200 feet above the ground, this giant ferris wheel offers some of the best views around! Maintaining the fastest go karts in Gatlinburg and Pigeon Forge, this high-action attraction lets you zip around curves, fly down hills, and race to the finish line on any of their 7 different tracks! Look for the shops under the red roof, and you’ll have found the Pigeon Forge Factory Outlet Mall. Shop for a variety of products—from perfumes to tools to clothes—at hard-to-beat, outlet-mall prices! "What a wonderful trip! Cabin was out-standing!!" We are so glad to hear you had a wonderful trip, and we couldn't agree more about how awesome Hillsong Heaven is! Come back soon! "We stayed in Hillsong Heaven, and it was exactly as pictured! The cabin is beautiful and the view is amazing. Everything was new, clean and working. The arcade table and hot tub were great. I would stay here again in a second. We also had no troubles with internet connection."